In New York Times bestselling author Anne Perry, the glorious era when Britain reigned supreme has found its most brilliant modern interpreter. Perry’s gripping new Charlotte and Thomas Pitt novel invites us back to Victorian London, where greed and ambition never sleep, and passion sometimes runs riot. As the nineteenth century draws to a close, most of Europe is in political turmoil, and terrorist threats loom large across the continent. Adding to this unrest is the controversial Sofia Delacruz, who has come to London from Spain to preach a revolutionary gospel of love and forgiveness that many consider blasphemous. Thomas Pitt, commander of Special Branch, is charged with protecting Sofia—and shielding Her Majesty’s government from any embarrassment that this woman, as beautiful as she is charismatic, might cause. When Sofia suddenly vanishes and two of her female disciples are gruesomely murdered, Pitt is challenged as never before. Is Sofia’s cousin, wealthy banker Barton Hall, somehow involved? And why has handsome cricket star Dalton Teague insinuated himself into Pitt’s investigation? Fearful that this sensational crime may trigger an international incident, Pitt welcomes the help of three allies: his clever wife, Charlotte; her great-aunt, Lady Vespasia; and Victor Narraway, Pitt’s friend and former commander at Special Branch. From the narrow streets of Toledo and a lonely monastery high in the hills of Spain, to the halls and wharves of London, Pitt and his friends race against time in their desperate bid to catch a murderer. Anne Perry is the acknowledged mistress of Victorian intrigue. No one else can match her period flavor, her all-too-human characters, or her haunting truths, which speak so clearly to our own time. 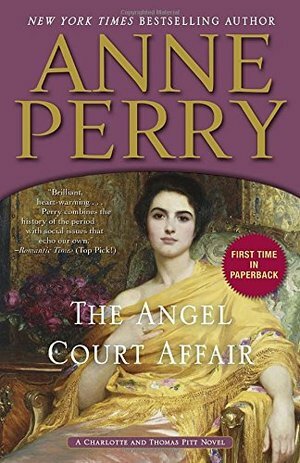 The Angel Court Affair may be the best of all the beloved Thomas Pitt novels.Praise for The Angel Court Affair “Brilliant, heart-warming . . . Perry combines the history of the period with social issues that echo our own.”—RT Book Reviews (Top Pick) “Be prepared for another well-deserved vacation to Victorian London with Anne Perry as the most cunning tour guide you will ever need. . . . She is one of the best.”—Bookreporter “Perry melds the intellectual debates of the day with a suspenseful plot line.”—Publishers Weekly Praise for Anne Perry’s most recent Charlotte and Thomas Pitt novels Death on Blackheath “Thoroughly enjoyable and entertaining . . . The period detail is beautifully done, and realistic characters and tense action are woven seamlessly together.”—Historical Novels Review “A complex and rewarding plot and outstanding characterization . . . a book that fans of Stieg Larsson’s Dragon Tattoo trilogy will find interesting.”—Huntington News Midnight at Marble Arch “Sweeping and scandalous . . . Perry has perfected a delicate touch.”—The New York Times Book Review “Perry is a master at illuminating the wrongs of the Victorian age.”—Booklist (starred review) Dorchester Terrace “The always clever Anne Perry infuses Dorchester Terrace with the right amount of intrigue and complex relationships that have made this prolific series one of the finest in modern mystery fiction.”—Bookreporter Treason at Lisson Grove “Perry has always done her historical homework on the darker elements of the British ruling class, and she has outdone herself this time.”—The Washington TimesFrom the Hardcover edition.